The European statistics after yesterday's positivity from Italy began to turn in the usual negative direction. The Spanish unemployment is not so easily reduced, despite the revision of the positive data for March - the current figure came out worse than expected, amounting to 25.9% as a result. Therefore, looking at the beginning of a full recovery is also not necessary. Rather, it is only the stabilization after a prolonged recession. Moreover, in the euro area for 23 consecutive months the decline in consumer lending continues. According to the latest data, in the last month, rates dipped by 2.2%. On the background of high unemployment, banks have become more demanding borrowers preferring to "park" funds in the accounts of the ECB. That is why the introduction of a negative deposit rate would be very useful in stimulating lending. Ironically, yesterday's rise of the Italian consumer confidence index caused retail sales to fall by 0.2%. It is clear that the index is a measure that reflects the current market mood and the retail data was only published for February. However, almost every year the publishing of statistics on retail sales is accompanied by expectations of growth, which has not yet occurred. On the eve of the release of statistics on European inflation Mario Draghi made a number of key statements to the German parliament. According to him, the program of quantitative easing "is not inevitable and now its launch is relatively unlikely." Let me remind you that in recent years Berlin was the consistent opponent of purchases of the bonds of European countries, even though the interest rates were extremely high. However, almost immediately Draghi made a reservation the to counter deflation, there still need to be considered unprecedented steps by the ECB from lowering rates to full QE, while noting that he sees no threat of a further fall in prices. Interestingly, the previous week in Amsterdam the head of ECB quiet clearly allowed for launching the purchases of assets in case of the deterioration of the medium term outlook on inflation. 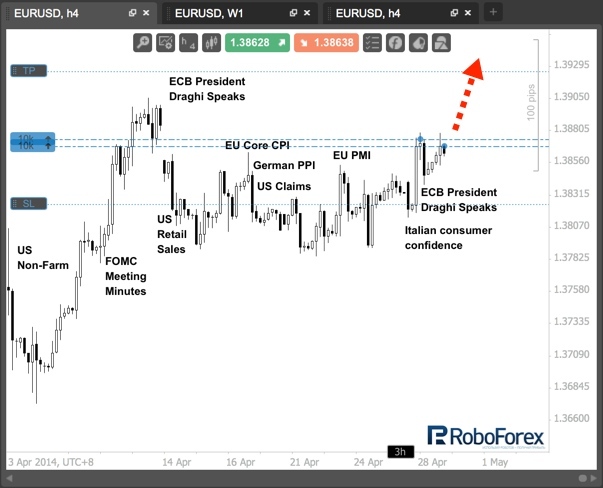 For the EUR/USD I will leave the deal as to buy, because after the recent statements by Mario Draghi, there is a substantial likelihood that even if tomorrow the inflation lever remains at the previous level of 0.5%, the regulator will continue to do nothing. Therefore is a high probability of going about the maximum of 11th of April. The German inflation data is not yet published, however if they are in line with expectations, the Bulls will certainly have support for the resumption of growth in prices.